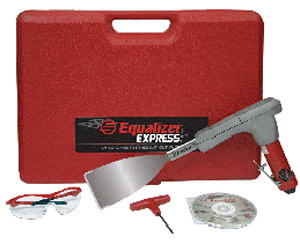 Equalizer Express Air Tool. Ball bearing construction, 0 to 2800 strokes per minute. kit includes one LBE1402 blade, safety glasses, blade key, and instructional dvd in a handy carrying case. Found under Auto Glass Tools in the Western Glass Supply catalog.